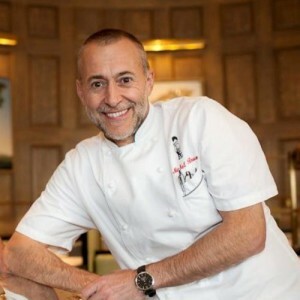 Created by Michel Roux Jr.
For the cherry sauce bring the wine and sugar to the boil, add the cherries and boil for 20 seconds, then remove the cherries. Boil the liquid to reduce until syrupy. Return the cherries to the syrup and keep warm. 1) Heat the oven to 150 °C/ 300 °F/ gas mark 2. 2) In a large bowl set over a saucepan of simmering water, melt the chocolate and butter together and then whisk the sugar, vanilla and salt. 3) Beat in the eggs two at a time. 4) Fold in the sifted flour. 5) Pour into individual buttered rings (7 cm diameter and 2 cm deep), and cook for 12 minutes, until set on the outside but undercooked in the middle. To serve: Decorate the plates with a little melted chocolate in a piping bag. 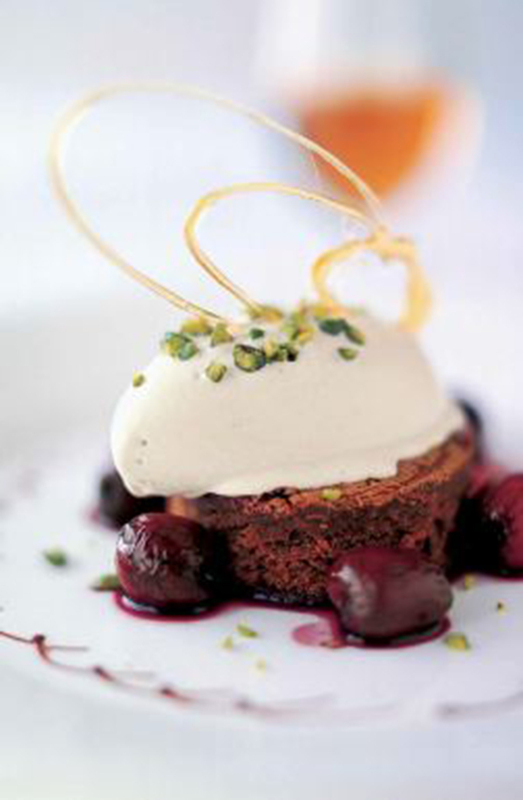 Place a warm brownie in the middle of each plate and arrange the hot cherries with the wine syrup around. Finish with a big scoop of pistachio ice cream and a few chopped pine nuts.